Posted on October 10, 2015, in General Blather, I Am That Wolf, Things That Make You Go... AAAaaaauuuggghhh!! !, Thriving With Lupus and tagged Autoimmune, Autoimmune Disease, Autoimmunity, Awareness, Back Pain, bucket list, Cardiomyopathy, challenged athlete, Christine Miserandino, Chronic Fatigue, Chronic Illness, Chronic Pain, disabilities, disability, Dysautonomia, Eating Healthy, Fibromyalgia, Friendship, Heart Disease, Invisible Illness, Left Ventricular Hypertrophy, Lupus Awareness, Motivation, Multiple Sclerosis, neurological disease, Plaquenil, POTS, progressive diseases, Raynaud's Syndrome, Spoon Theory, Support, Systemic Lupus, The Spoon Theory, truth. Bookmark the permalink. 24 Comments. Especially relevant blog from Tala during this time that Lupus is the talk of the town- with Selena Gomez coming out with her lupus & chemotherapy for the disease. There isn’t a one of us with autoimmune disease that hasn’t struggled with some of these issues. Tala nails em with eloquence & fortitude. Don’t miss this one! Standing ovation, round of applause! Tala has perfectly described what it’s like with Lupus or any autoimmune illness. Our struggle can be a lonely one if our friends and family do not take the initiative to research and learn about our illnesses or even give us the time of day to attempt to explain things. If you don’t look sick, how can you be sick? Well……. I’m sick. And while a few very close friends are understanding and knowledgeable, the vast majority of my friends and family are not and they continue to deny that my condition is serious and are always trying to compare their lives or someone else’s lives to my own. My greatest allies are those in the autoimmune community who can honestly say to me “I understand” when I vent or gripe. Education and knowledge is the best way to combat the ignorance that is lobbed at autoimmune sufferers. There is so much awareness and information out there about many other diseases and hardly any when it comes to the vast majority of autoimmune diseases. And it’s past time that it needs to be addressed. Reblogged this on Tala's Tracks. Thank you so much for such a powerful and effective post. I have been sick for seven years, but just started telling people last year, due to most of the attitudes that you mention in your post. I am hoping to one day be as assertive as you are about my rights as someone with a chronic illness. Seriously, thanks so much for sharing. You are most welcome. Thank you for taking the time not only to read but to comment as well. I completely understand the hesitancy to speak up for yourself. It becomes important to advocate for yourself when dealing with physicians, and it is a useful skill dealing with other people as well. It takes time. You’ll get there. I read your reflection to my husband. He was moved to tears, not just by your personalization of the story, but mostly because your words told my story as well. He has been by my side for over 35 years. He was there when I was a healthy, able-bodied wife, mother of three, teacher, coach, community leader, etc. zooming through life full speed ahead. He was there as my body began its rebellion complete with fevers, rashes, blisters in my mouth, inability to tolerate heat or cold, and the fatigue and pain that was so prolific I sometimes could not get out of my car and walk in the house. He was there as I went from doctor to doctor with no answers all the while I tried so valiantly to power through each week, each day, and then finally each hour. He was there each time I was in the hospital as the doctors took out my reproductive organs, my appendix, my thyroid, and when I was rushed to the ER fearing a heart-attack only to find out that it was pericarditis. Even then we had no answers. No one connected the dots. Looking back, they so clearly lead to a SLE diagnosis. Yet, those around me seemed to have all the answers and he heard them all…Like, you need to get some sun, you need to eat this or that, take this vitamin, do this cleanse, quit thinking about it, read this book, pray more, stop being so negative…and this list goes on. He’s heard the comments from those who knew someone who had it and they worked until the day they died (at 52! ), and to bring this rant back to the theme of your reflection, he has been there as every part of the life I had has been slowly taken away from me. He has seen me cry myself to sleep because another school year has started and I want so badly to be in the classroom, but I can’t. My body is unreliable. My health is fragile at best and my emotional state isn’t far behind. He knows that the two comments that can take my breath away, steal any happiness I may have at that moment, and kick my feet out from under me are why can’t you work and you don’t look that sick. Those comments are usually followed up with, but I saw pictures of you on Facebook standing on a rock at the Grand Canyon…if you can do that, you can work. They have no inkling of the effort, planning, and afterburn of one of my bucket list events require. They don’t know that he helped me get dressed, drug and carried me up the trail, hoisted me on the rock, climbed down, took the picture (while praying that I didn’t pass out of fall) then hoisted me back down, drug and carried down the trail and then watched me suffer the consequences. All so I could have a moment of awe. The only people in my life that truly know my story are my husband and my children and they are quick to shut anyone down who spews hurtful comments. So, when I read your reflection to my husband he felt, for the first time someone understood. Thank you, Tala, for leading the road of advocacy for invisible illnesses. As you walk forward know that we are behind you. Your post is like you’ve read my life story. I’m so grateful each day to have my husband by my side while I fight what the lupus is doing to my mind my body. I’m so glad you’ve got a wonderful person with you too, I couldn’t imagine living with my lupus alone. Thank God for good spouses that remain after the disease takes almost everything else. I have a friend that ended up with a similar experience. Her second attempt to go with family on a cruise – a gift, so not on her dime – she flared and could barely do anything. Sadly it created a lot of contention with family, because some of them don’t seem to understand the nature of the illness. It’s a shame but it does happen. Some people simply cannot accept that there are diseases that have intermittent manifestations. A large portion of society seems to be programmed to believe that there is a clearly defined appearance for each malady. They definitely cannot understand that some of them don’t have any particular appearance. You would think that would be easy to understand, considering you can’t see a lot of things that go on inside the body… such as heart disease. I suspect with something like that people have been programmed to believe that if you have a heart condition, you must be older or if you have diabetes, you must be overweight. These things can happen without any outward evidence. Young, healthy, active people even drop unexpectedly from heart attacks sometimes. People seem to have a need to categorize things neatly. That is not possible with an autoimmune disease. If only… SSI… SSD… Medicare… our Drs… various nurses… insurance agents… LOL There are a whole lot of people that need to open their eyes and their ears better. Thank you! I needed this today of all days, as I am preparing to quit my at home job that I had prayed would be the answer to being able to continue working and bring in money. I really thought without the driving I could do so much better. Laying in bed working is still just too much and it saddens me because I truly want to bring in good money and be able to provide for myself. Disability frankly scares me because I don’t know how anyone lives on it. I am fortunate enough to have a great man that supports me, so I don’t have to rely on it alone. Re living on disability – some choose to find very limited part-time work for income under the limit cap allowed. That helps supplement the payments. Others just have to exist very meagerly. I hope that the changes for you go smoothly. It sounds like you need a well-deserved break. 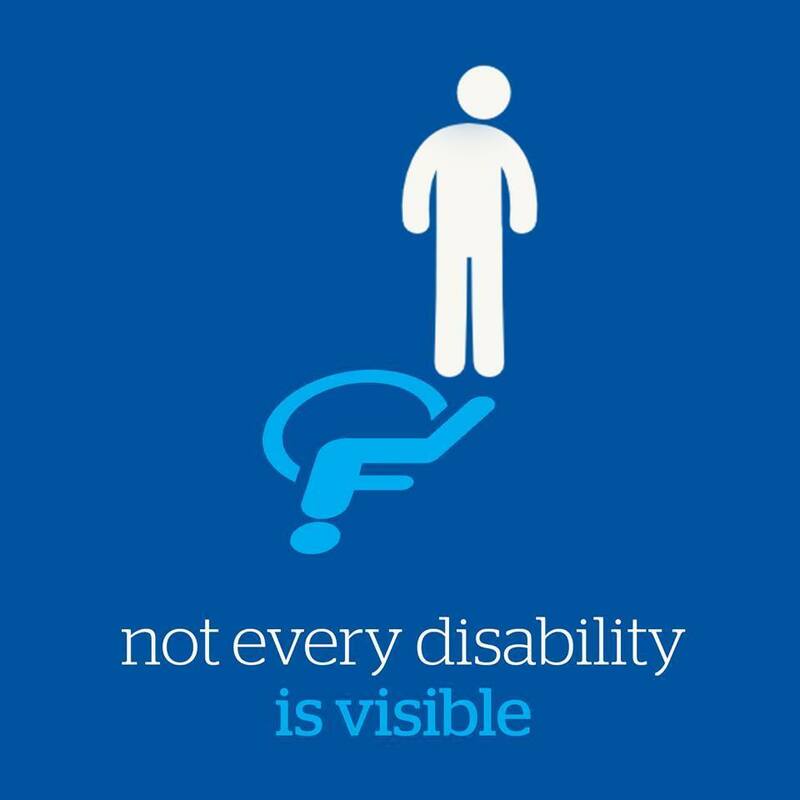 That is invisible illness for you. Most people expect to see something obvious on the outside, and when we look relatively “normal” they don’t know how to categorize us. Even with in our own community – everyone that has an illness of this nature – I find that you will still run into people that don’t have a concept of the severity of certain conditions. Some of that is ignorance and some of it is just something they never really thought about. One of my best friends developed sacroiliitis and gained a new appreciation for the pain that I have experienced with the sacroiliac joint injury. She actually came back to me and told me she had no idea what I had been going through. She was extremely sympathetic at that point, not that she had ever been unsympathetic. She just didn’t know that much about it. This was coming from someone that has experienced levels of pain with other conditions that I know nothing of. For us it is important to develop the personal confidence to be able to simply see the position of others as coming from a place miseducation, and a lack of information. As a patient, you are better informed, better equipped for compassion, and more experienced and knowledgeable in medical topics then the average citizen. Recognize your own skill. We have a natural ability to empathize with others in pain, and those that are readily dismissed. The only person that is useless is the one that would dismiss any of us and refuse to learn. This makes me SOOOOOO happy! It describes my daily battles to a tea. I have been battling this for years, with next to no support. It has crushed my spirit and I felt so alone. I had no support from people, and no support medically, so I wasn’t even educated about why I was the way I was and I just kept pushing myself until I almost died on more than one occasion. For those who don’t know I have a Traumatic Brain Injury, and I’m being referred to a Lupus specialist (due to abnormal tissue damage and something off with my cell account) and the doctors suspect I have fibromyalgia, so this blog is very relevant to me. This is what I posted on my Facebook page. I hope some people in my life take time to listen. “ATTENTION YOU! Begging anyone who cares about me and my health conditions, or anyone who has a friend or relative that has an autoimmune disease like Lupus, Rheumatoid Arthritis, Multiple Sclerosis, or other invisible illness like Chronic Fatigue Syndrome, Lyme Disease in chronic stage, or neurological conditions like Fibromyalgia, to read this!!!! This blog makes me SOOOOOO happy! It describes my daily battles to a tea. I especially appreciate how it pointed out that we aren’t allowed to have fun and the constant accusation of being lazy essentially “If you can do that…why cant you work?” -Which the answer is basically that my health varies so much from day to day that I’m unable/unreliable and therefore unable to work. My health crash for prolonged periods of time and I’m never able to predict when or for how long I will crash or the severity of it. EVERY day is a battle. For those who don’t know I have a Traumatic Brain Injury, and I’m being referred to a Lupus specialist (due to abnormal tissue damage and something off with my cell account) and the doctors suspect I have fibromyalgia. So this blog is very relevant to me. You know what’s sad? I’m JUST starting to receive some help and support in the past year. I’ve just started to receive disability. I’ve just started to have the opportunity to see the doctor (Though it’s a constant fight for me to even get to my appointments, or get anywhere for that matter) and it’s overwhelming. So I ask you, anyone who reads this. Take time to care about those in your life who are battling chronic illness, because we never get a break from it. It’s a daily battle, and its lonely, and its tough. Those of us who battle chronic illness feel like we’re forced to put on our happy faces all the time because there are very few who care enough to be there as a support.